It is not easy to get to this lake. It is located 100 km downstream the Amur River from Khabarovsk, on marshy left bank where there are no roads. I wanted to have a boat at the lake, so I had to go by an inflatable kayakmade by Bratan, with a small outboard jet-motor. I was able to cross several channels of the Amur up to 1 km across; in this boat one feels secure on the medium size wells. First I am is crossing a little pond, and then pull the boat through brush and thick grass. Prussian carp is biting small nymphs which should be presented at the bottom, with jerks and pauses. I was catching Prussian carps of different sizes; some were not small. Except the nymphs I was using silicon insects on a small jig. 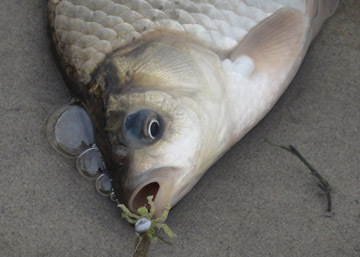 It looks like the Prussian carp in some cases is using mostly his sight, and chasing actively moving artificial lures. and even a tiny yellowcheek!